Gobble, gobble! : We had a quiet, relaxed Thanksgiving day, as dinner was at Kitty's house, and we had to make and contribute only a few items. Cameron was even home from school, giving us a rare day all together. So on November 24th we were thankful for sleeping in; for spending time together cooking and baking, playing board games, and otherwise enjoying each others' company; and for all the good food we were privileged to eat in the span of 16 hours! Boo! : Sofia had a busy Halloween. On the 27th, her school hosted a pumpkin carving event. Sofia was very proud of not only designing her own pumpkin but also carving it. 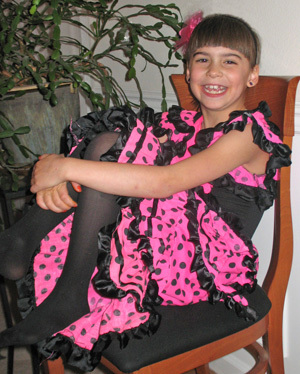 On the 31st, she spent the whole day at school in her costume, a flamenco dress we bought while in Spain. The school-wide festivities included a parade among classes, with different games and prizes in each room, followed by a craft project, cookie decorating, and lots of treats for her class party. That night, she donned warmer layers under her dress and trick-or-treated in cool, but dry, weather. She was so excited that she never stopped talking the whole time, and all that movement appeared to keep her warm, even when Amy began to chill! She didn't count her candy, but she certainly collected enough to last a month or two! More can be found on Sofia's page. 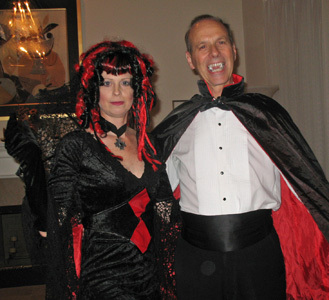 Dracula and the Black Widow: Jan and Amy attended a costume ball October 29th. Our well-matched Dracula and Black Widow costumes (including Amy's large, round web and wig) made it through three hours of swing and waltz. We didn't win a costume prize, but we had great fun—bwah-ha-ha-ha! Second grade: Sofia began second grade on September 6th. 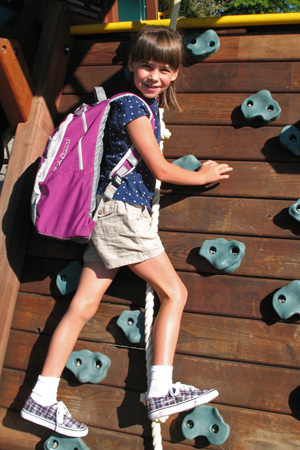 She attended school in shorts all week, since summer has finally and truly arrived in western Washington (we've had an eight-day string of 80-degree days and above) just in time for the kids to be in the classroom. She likes her teacher, and she's excited to be back.